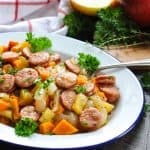 Sweet, savory and full of flavor, this healthy Dump-and-Bake Chicken Sausage, Apple and Sweet Potato Casserole is an easy dinner recipe that comes together in just 10 minutes! Spray a large baking dish (about 9 x 13 inches) with cooking spray. In the prepared dish (or in a separate bowl), toss together potatoes, apples, onion, and sausage. In a separate small bowl, whisk together olive oil and dry soup mix. Pour sauce over potato mixture and toss to coat. Transfer to baking dish; cover with foil, and bake for 35-40 minutes, or until potatoes are tender. Cooking Just for Two? Cut the ingredients in half and bake the casserole in an 8-inch square dish. The rest of the instructions remain the same. You can use any fully-cooked sausage, so pick the brand, flavor and ingredients that you love! Kielbasa would work well, too!